Oil production at Kazakhstan’s Kashagan oil field will be completely stopped for 45 days, Trend reports referring to Kazakh media. 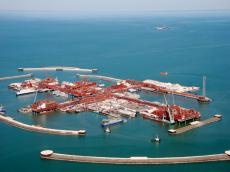 "In accordance with the regulatory requirements, in 2019 NCOC (North Caspian Operating Company) plans to overhaul the Bolashak ground complex and the D marine complex of the Kashagan field in the Caspian Sea," said the NCOC statement. The overhaul implies carrying out scheduled preventive maintenance of technological equipment on the D island and Bolashak oil and gas treatment plant with a complete stop of production. The planned stop time is 45 days. All equipment will be stopped for the period of overhaul, and the production of oil, gas and sulfur will be completely stopped. The oil produced before the shutdown will be fully exported. It should be noted that in 2018, NCOC, which operates the Kashagan field, produced 13.2 million tons of oil.